This picture shows a couple of Beaufighter torpedo bombers of RAF 236 Squadron, attacking an anti-aircraft 'flak ship' in the English Channel, some time after the Normandy invasion of June 1944. The German flak ships were a deadly weapon, loaded with quick firing anti-aircraft guns they put up a wall of steel through which British and American bombers regularly had to pass to reach their targets in Europe. 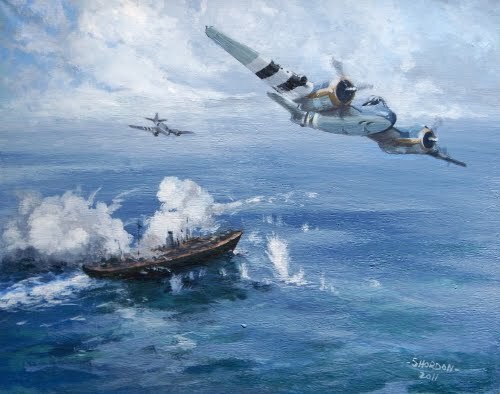 In the picture, the lead Beaufighter has dropped his torpedo and scored a direct hit, while his wingman is coming in to drop his, firing cannons as he does so.